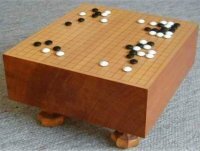 Go (also called wei-qi and baduk) is a two-player board game along the same lines, distantly, as Chess, but more ancient and more interesting. It’s huge all across Asia but virtually unknown here — possibly because, like jazz, it’s too abstract for most Americans. You may have glimpsed the game in movies about mathematicians: Pi and A Beautiful Mind. Mathematicians, of course, are better equipped than anyone to reason about and enjoy abstractions. The appeal of Go lies in the dichotomy between the extreme simplicity of its rules and the unbelievably rich complexity of the gameplay to which they give rise. Its stark aesthetics are striking too: the ideal Go board is a thick block of beautiful blonde wood, its playing surface a grid of thin black lines (laid down with the edge of a katana dipped in ink! ), and the playing pieces contrasting circular “stones” of black slate and white seashell that jostle each other as they make intricate patterns on the Go board. I first encountered Go when I worked on the Andrew Project at the Information Technology Center at Carnegie Mellon University in the late 1980’s. A handful of staff members were devoted players and often played at lunch in the ITC lounge. As simple as the rules of Go are, I could barely follow the games that I watched at the ITC. This is typical for newcomers to Go and demonstrates one of the really interesting things about the game: from the rules come patterns of play; from those patterns come meta-patterns; and from those, meta-meta-patterns. Two experienced players of comparable skill can wordlessly agree to disregard entire areas of the board by virtue of recognizing ahead of time what would happen if they did play there. This was perplexing to me at the time. Watching the skilled players at the ITC, I was like a child who had just mastered the alphabet, trying to use it to understand grammar. Eventually I played a few real games and quickly started to get the hang of it. As I did, I could feel my brain changing. I had played chess before; this was different. It felt like gameplay stripped to its bare essence. The pieces weren’t anthropomorphized as in chess (“kings,” “bishops,” etc. ), there was no need of dice to insert an element of randomness as in backgammon. Every point on the grid was the same, every playing piece was the same. It was all about patterns and nothing but. Insofar as pattern recognition is the essence of human intelligence, playing Go felt like setting aside all the unimportant stuff in my brain and exercising just the good bits. I played Go just a few times at the ITC, mostly because my skill level matched so poorly with that of the other players there. But I was hooked, so for years I tried to interest friends and family in Go, with extremely limited success. I played a few games against faceless strangers via Internet “Go servers” and the occasional game against the computer, but they just weren’t the same — in large part because the appeal of the physical board and stones were missing. So when we learned we were going to have a baby, I remembered having once read that in Asia, families teach their children Go from around age 5 (with supposed benefits to their overall intelligence) and figured that, when the time came — sooner rather than later — I would teach Jonah and hopefully hook him the way I got hooked. If I can’t find a good Go opponent, I can damn well make one! And this week, that’s just what I did. At age almost-5, Jonah’s mind shows unmistakable signs of having an analytical bent, perfect for Go. I used the “Capturing Game” teaching strategy. He and I played three games in a row of “Capture,” spending far longer than I expected his attention span to last. It was fantastic — the intellectual enjoyment of Go together with paternal pride at Jonah’s burgeoning brainpower, wrapped up in the serene happiness of spending quality time with my son. In the late 1980s and early ’90s, I worked on the Andrew Project at the Information Technology Center at Carnegie Mellon University, where Adam Stoller was a fellow programmer and system administrator. On at least three occasions I opposed Adam’s advocacy of something or other, only to reverse my opinion later. Adam kept trying to interest me in XPilot, a space-battle game; but I found it confusing and could never get interested in it. Years later I became a huge XPilot fan. I’ve even contributed several new features. American pop culture regarded sushi askance during my formative years. Adam was also known for his abiding love of sushi. At that time, sushi hadn’t permeated American culture to the extent that it has now. I found the mere idea of eating raw fish to be repellent, and never hesitated to say so to Adam — perhaps even cruelly. Now hardly a day goes by that I don’t crave a meal of sushi. Once, after a considerable research effort, Adam tried to convince the ITC to switch from using RCS for source code control to using CVS. CVS was fairly new at the time, and I was among those who were distrustful of CVS’s fundamentally different approach than that of RCS. It didn’t require files to be locked before being edited; instead, if two developers edited the same file at the same time, they were later obliged to use a dubious merging algorithm to resolve any conflicts that may have arisen. Collectively we defeated Adam’s proposal and continued using RCS. Within a few years, though, CVS became the de facto standard for source code control in organizations with multiple software developers; no one even considered using RCS anymore. I’ve even contributed some bugfixes to CVS. Adam, you were right about so many things, and I was wrong.